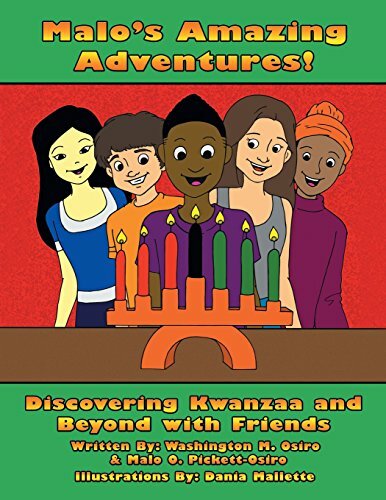 Discovering Kwanzaa and Beyond with Friends is the 2nd book in the Malo's Amazing Adventures! series. It is dedicated to Malo's 4th Grade Class of 2012 at Wicklund Elementary School and to Kylie Johnson and the students of Woodside Parents Nursery School Class of 2013. Both classes were gracious enough to invite me to their respective class to speak about Kwanzaa. The book is also dedicated to all the other inquisitive little souls who are not afraid to ask the questions: How? What? When? Who? Where? and the all-important Why? While preparing to speak to the two classes, Malo's father discovers that Kwanzaa is more than a cultural celebration. It embodies principles or "nguzo" that are universal, enhance personal growth and development and promote good citizenship. In the process, he discovers and shares the richness of Kwanzaa and its appeal beyond the traditional and mainly African-American audience. Maybe you don't speak or understand a foreign language such as Kiswahili. Maybe you have difficulties pronouncing foreign words such as "eng-oo-zoo saba" or "vitu saba" i.e. the seven principles and symbols of Kwanzaa - all Swahili words. Don't let that prevent you from learning about the richness and beauty of celebrations such as Kwanzaa and their relevance to everyday life. Read on to discover the joy of learning a different language or experiencing a different culture.